The extra large Director's Cut Video Vest from Porta Brace is designed for ENG (Electronic News Gathering) and EFP (Electronic Field Production) photographers as well as sound technicians. It has numerous exterior touch fastened storage pockets for various sized batteries, tools, wallet, rain slicker, a small camera, phone and other rapid access items. The exterior also has a key ring and press pass/ID window. There is also an interior pocket for items you wish to keep out of the elements. This is a vest designed for location work since it is made from water-resistant Cordura. Deerskin suede accents, antiqued hardware and a soft lining add to the vest's overall quality. The main zippered closure is complemented by side zippers that, when opened, provide additional freedom of movement. 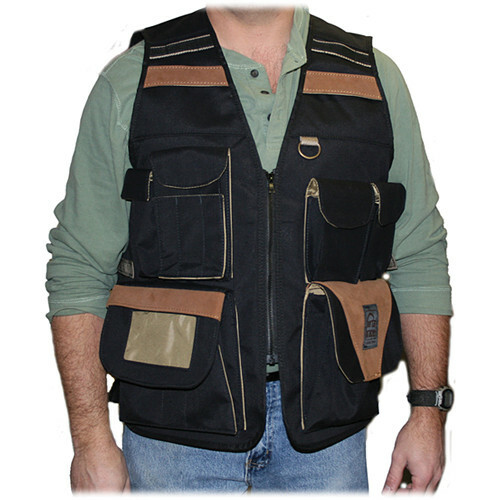 Adjustable side tabs enlarge the vest to accommodate wearing a sweater. The rear panel has an additional pocket and is mesh for increased air-flow and comfort. Box Dimensions (LxWxH) 16.0 x 10.7 x 2.9"